In this final post about the masks of Camilo Álvarez Buitimea I will continue to mix made for sale masks with others that were said to have been danced. I will begin with a made for sale goat that could easily have been used by a dancer. This mask greatly resembles other goat faced masks that were carved by Camilo’s father, Inez “Cheto” Alvarez. We might call this a “conventional” made for sale mask, in contrast to the majority of Camilo’s made for sale masks that are so unconventional, but to my eyes wonderful. This looks like a faithful copy by Camilo of the usual goat faced Pascola masks that were carved by Cheto Álvarez. Last week we looked at three or four made for sale masks by Camilo Álvarez Buitimea, followed by dog and human faced masks by this carver that had been danced. Today we will examine some additional danced and made for sale examples, but with a difference—the danced masks will prove to be as unusual as the made for sale masks. 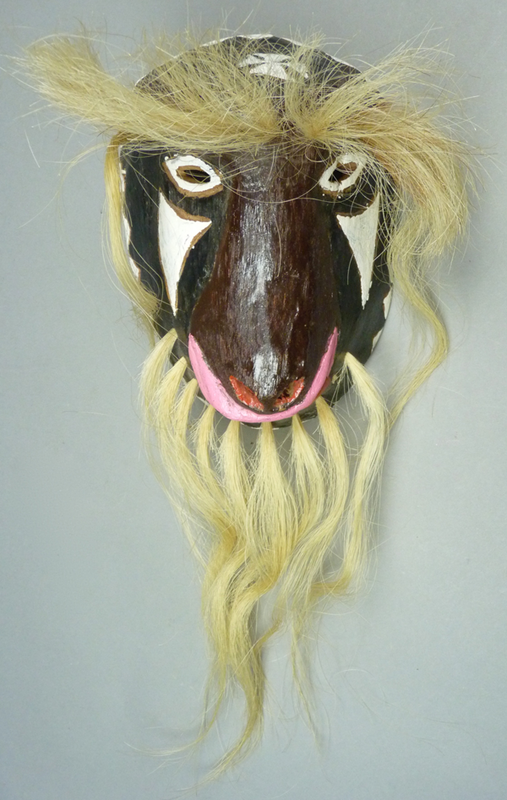 I ‘ll start with one of the made for sale masks, apparently depicting a skunk. 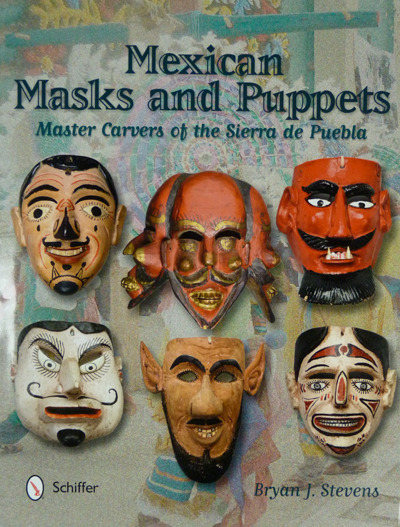 There is only one Yaqui carver whose masks could possibly compete with the unusual animal masks of Jesús Rodríguez Muñoz, and that is Camilo Álvarez Buitimea, the artist who carved that beautiful lizard mask in an earlier post. 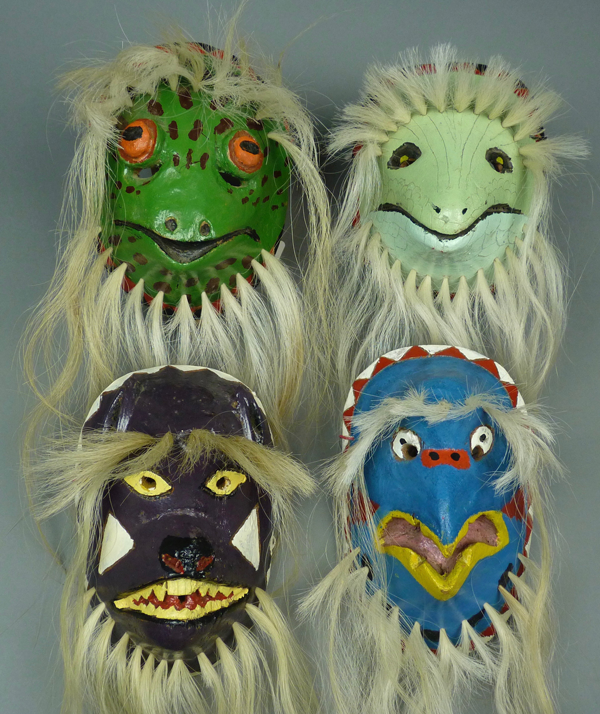 Here is a group of undanced masks by Camilo that includes this lizard. We will examine the other three masks today, along with two others by Camilo that were collected by Barney Burns and Mahina Drees as danced masks. In the last two months we have examined masks by four members of the Rodríguez family—brothers Rodrigo Rodríguez Muñoz and Jesús Rodríguez Muñoz, their father Preciliano Rodríguez Cupis, and their uncle Conrado Rodríguez Cupis, who is the brother of Preciliano. Based on stylistic details, my friend Tom Kolaz and I have noticed many masks which were undoubtedly carved by one of the four, although erroneously attributed to other carvers (some in and others out of the family). It is evidently difficult, even for Rodríguez family members, to decide which one of these artists made a particular mask. I sometimes can only offer my best guess. My friend Tom Kolaz even wonders whether some of these masks were the result of a group effort. 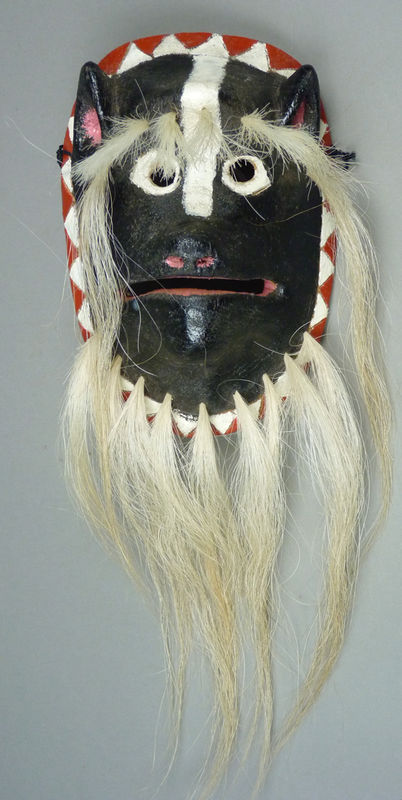 Today I will show several of these masks that seem particularly difficult to assign to a single carver. 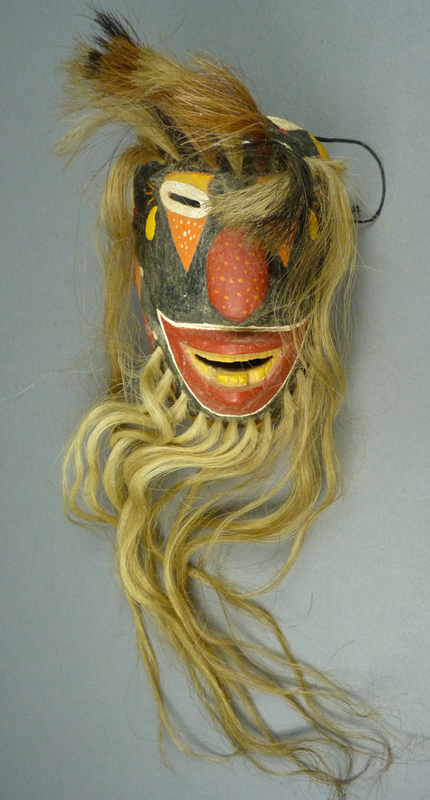 For example, here is a photo of the final mask in today’s post, a Payaso (clown), to whet your appetite.